I'm a Windows PowerShell Enthusiast trying to spread all the great things PowerShell can do with the world! 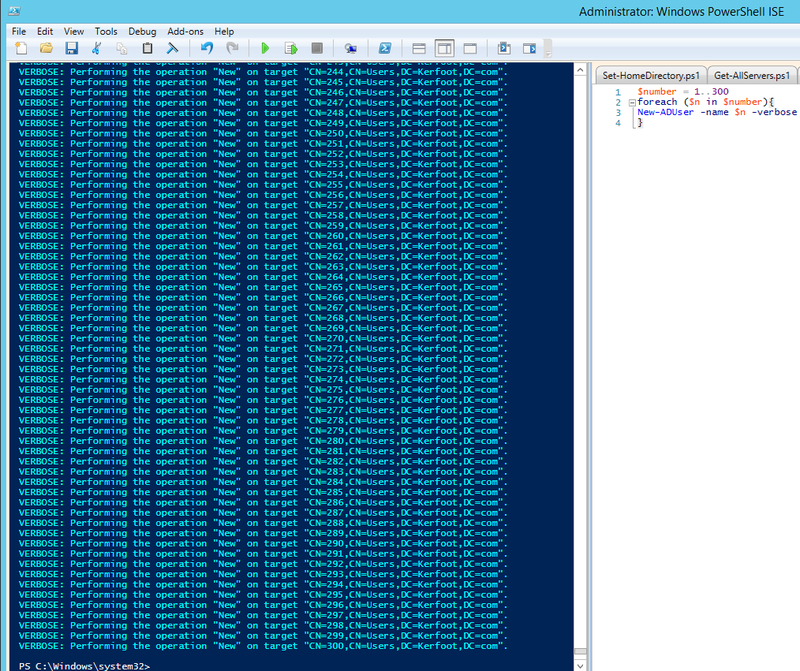 The below script with go through a list of PowerShell links and open them each up one at a time within a single tab. Every 2 seconds a new article will appear -- when you find something good just hit [CTRL]+C to stop the script form continuing. Easiest way to create a lot of AD accounts. If $number is an array from 1 to 300 and for every number or $n we run New-ADUser -name $n were going to get 300 users with names like 1, 2 , 3, 4..300. Here is what I like to call a little fun function, this function allows you to easily search www.google.com for anything your heart desires. By default it will search for "The Overnight Admin" unless you specify with the -Search parameter like I did as an example on line 34. The reason that just typing Start-Google at will search for "The Overnight Admin" is because within the param block I've set the $Search parameter to equal the "The Overnight Admin", but if you type Start-Google -Search "powershell" that will overwrite the $Search parameter and open the Google search page for powershell. $Search = "The Overnight Admin"
Start-Google -Search "Enter Hilarious Search Here"
Add Devices to LogicMonitor with Speed! The views expressed on this site are my own and do not reflect those of my employer or its clients. The content here belong to The Overnight Admin and it’s contributors. THIS CODE IS MADE AVAILABLE AS IS, WITHOUT WARRANTY OF ANY KIND. THE ENTIRE RISK OF THE USE OR THE RESULTS FROM THE USE OF THIS CODE REMAINS WITH THE USER.